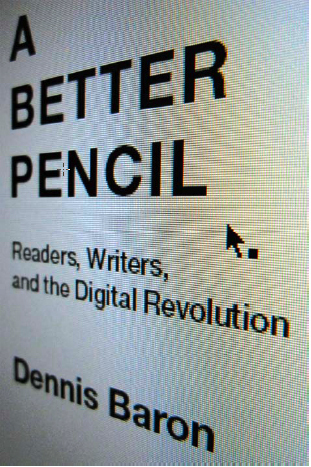 I very much enjoyed Dennis Baron’s new book, A Better Pencil: Readers, Writers, and the Digital Revolution, and highly recommend you pick it up. Baron does a wonderful job exploring the history of techno-pessimism and the endless battles about the impact of new technologies on life and learning, something I have written about here before in my essays on “Internet optimists vs. pessimists” (See: 1, 2, 3). I have a complete review of Baron’s A Better Pencil now up on the City Journal‘s website here. I’ve also pasted it down below. In the beginning, Dennis Baron reminds us in his new book, A Better Pencil, there was the word—the spoken word, that is. Oral tradition, the passing of knowledge through stories and lectures, was the primary method of instruction and learning throughout early human civilization. But then a few innovative souls decided to start writing everything down on stones and clay. Almost as soon as they did, a great debate began on the impact of new communications technology on culture and education. And it rages on today, with a new generation of optimists and skeptics battling over the impact that computing, the Internet, and digital technologies have on our lives and on how we learn about the world. Of course, as Baron points out, we remember this warning only “because Plato wrote it down.” It’s one of the recurrent ironies in the history of techno-skepticism that while “the shock of the new often brings out critics eager to warn us away,” those critics often embrace—or, at the very least, benefit from—the very tools that they want the rest of us to shun. Whether it’s Luddites On-Line winning Yahoo’s “Cool Site of the Day” award, or the Writing Instrument Manufacturers Association promoting National Handwriting Day via the Internet, or Ted Kaczynski’s Unabomber Manifesto attracting unprecedented readership thanks to its availability on the Web, those who have a “common tendency to romanticize the good old ways” of doing things often fail to appreciate how new technology can benefit society—including themselves. Baron walks us through a litany of historical examples—the printing press, the telegraph, telephones, typewriters, pocket calculators, personal computers, word processors, webpages, blogs, social-networking sites, and more—and identifies the usual pattern: we greet each new technology with deep distrust and dire warnings, but in time we adapt to the new realities. Indeed, as a species, we have an unparalleled ability to learn new ways of doing things. We don’t always like technological change, and often we deeply resent or fear it, but in the end, we learn to live with it and eventually to embrace it. The backlash against computers and digitization began while the Internet was still in its cradle, with the 1992 publication of Neil Postman’s anti-technology screed, Technopoly: The Surrender of Culture to Technology. Postman’s intellectual descendants include Internet critics such as Lee Siegel, Andrew Keen, and Mark Helprin, whose works drip with disdain for all things digital. They warn of a coming dystopia where truth and authority vanish, culture crumbles, and political polarization breeds closed-mindedness and even the death of deliberative democracy. These overly pessimistic critics turn a blind eye to both the wonders of the digital age and humanity’s ability to adapt. As Baron persuasively argues, “English survives, conversation thrives online as well as off, and on balance, digital communications seems to be enhancing human interaction, not detracting from it.” In fact, we live in a world of unprecedented media abundance that previous generations would have found unimaginable. As Baron puts it: “The Internet is a true electronic frontier where everyone is on his or her own: all manuscripts are accepted for publication, they remain in virtual print forever, and no one can tell writers what to do.” Such human empowerment is worth celebrating, even if it does have the occasional downside. Abundance is better than a world of scarce choices and few voices. Baron’s retelling of the history of techno-skepticism is edifying, but it leaves one with the nagging feeling that these debates will never cease. Each generation will witness a technological watershed that brings out a fresh crop of both pollyannas and pessimists. Like Plato, however, most of us will embrace whatever’s next and move forward.